Round bed sheets in 200, 400 & 1000 threads to the inch fabric. If you cant find your size in here, please contact us on (+44)1706 220020 for a quoted price or mail us your requirements. We'll be happy to help. Round Fitted Sheets in 100% Cotton.Made to order and to fit any length, width and depth of round bed.. 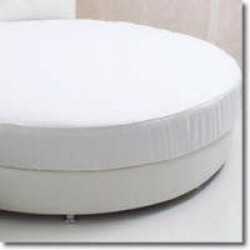 Round Fitted Sheets, made to order and to fit any length, width and depth of round bed mattress.1000.. Round Fitted Sheets in 400 Thread Count Cotton.Made to order and to fit any length, width and depth .. Round Bed Fitted Sheet in 11 ColoursFitted sheet to fit round bedsMade to order and to fit any width..